18M57 34x60cm Winds of Change, Acrylic on stretched canvas. My paintings hatch… bit by bit, starting as a little vague idea in my head, sometimes I walk with the possibility of an image for days, weeks, even months before it gets to a point of breaking through, even then, I usually do not know precisely where the image will end up once I put my brush to the canvas. Still unsure but with an idea of an idea, if I can describe it like that, I make my start, I put the clearest part of the image I see in my head on the canvas, and wait and see what pops up next. 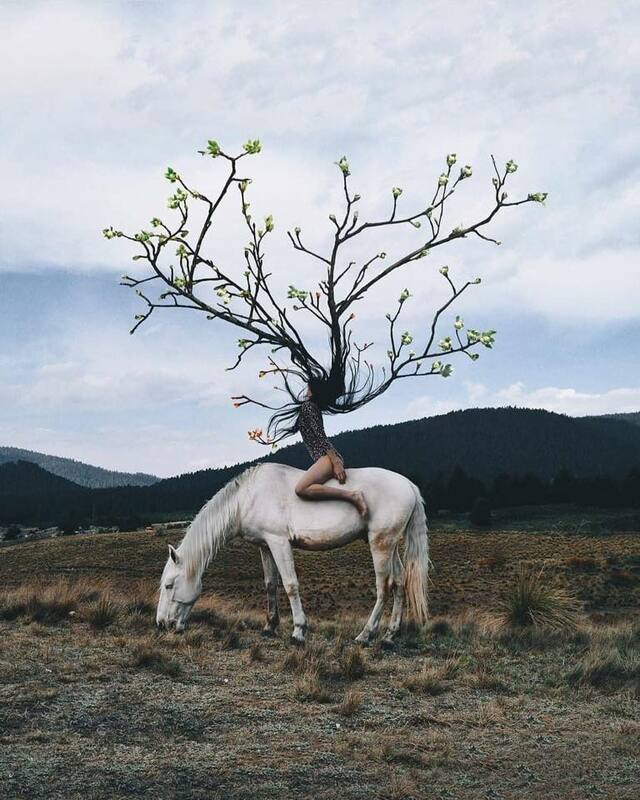 In the case of this painting, I saw a magical image of a woman on a horse, her hair thrown back, becoming like the branches of a tree, fresh leaves sprouting from the branches. This image by the photographer, Gabriel Avram made such an impact on me and I immediately knew that it will lead me to a creation of my own. The image stayed in my head and one afternoon when I went for a walk, I saw this beautiful dead creeper and took a photo of it, not sure what I will use it for but it added to the idea of the photo of the woman on the horses back. The paradox of the new fresh leaves on the branches of the woman on the horse in contrast with the died-off creeper lead me to the theme of the “winds of change” of my painting, a new season symbolizes a new start. I associate Swallows with a new start, therefore a Swallow was the logical choice for me to add to this painting. The dying off of an era or time or people in your life, however good or bad it was. Memories intertwined into your being. The new chapter, like a new season lying ahead. The egg, also symbolic of new beginnings, and of comfort, save in its nest. A lot of my paintings is about change and Omens leading you in a new direction. As with this painting, also the dead branches, combined with life-giving elements like birds and animals and bees. These paintings and more can be bought via my website or social media pages. 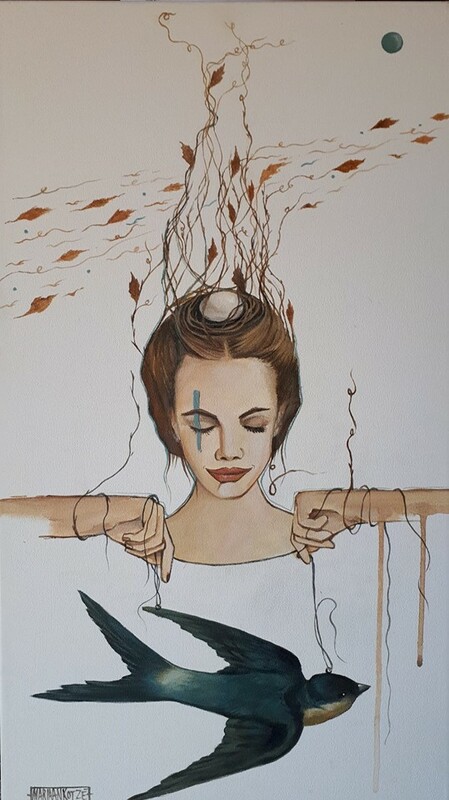 Posted in Blog and tagged paintings, Mariaan Kotze, Acrylic Painting, Canvas, artist, art for sale, symbolic art, Birds, Swallow, Migration, change, time of life, bees, buck, Gabriel Avram, photographer.